There are many natural herbs and herbal supplements that can be used for asthma treatment. Natural asthma treatment incorporates vitamins, minerals, and herbs to relieve symptoms and prevent further attacks. Asthma is a respiratory disease that affects both adults and children and today asthma is one of the most common chronic childhood ailments in the world. There is no scientifically proven cure for asthma, but it can be controlled and regulated. Natural treatments for asthma are meant to complement, or as an addition, to any existing medication but never as a replacement. Before using any herbal asthma remedy, it should be kept in mind that medicinal herbs can be as powerful as pharmaceutical drugs and should be treated as such. 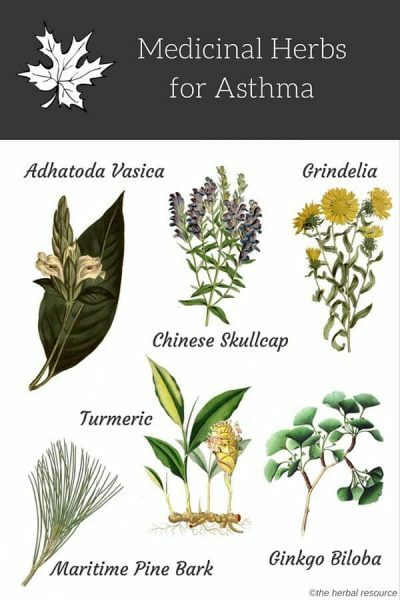 It is always important to seek the support of a qualified healthcare provider before use as some medicinal herbs for asthma treatment may interact with pharmaceuticals commonly prescribed for asthma. Adhatoda vasica is a small evergreen shrub that is found at lower altitudes in India and South East Asia. The leaves of the herb have been used for centuries to treat asthma where they work as a bronchodilator and mild expectorant. Adhatoda also works by decreasing the viscosity of mucous to assist with expectoration. Principal constituents of adhatoda leaves are the quinazoline alkaloids (0.5–2%). The major alkaloid is vasicine present at levels of 45–95% and is the source of the drug bromhexine, which is often still used to assist expectoration. One of the oldest herbs in use today, ginkgo has a broad range of indications. For people living with asthma, ginkgo works to inhibit PAF (platelet activating factor), a potent inducer of platelet aggregator and anaphylactic reactions. Medicinal herbs that stimulate anti-PAF activity are known to assist in the treatment of asthma, allergic reactions, thrombosis and shock. One study showed that a 600 mg standardized dose of ginkgo reduced airway hypersensitivity in patients with asthma. Coltsfoot (Tussilago farfara) has been used medicinally as a cough suppressant. The plant has been used in historical times to treat lung ailments such as asthma as well as coughs by way of smoking. Studies from 2002 on a standardized extract from maritime pine bark (Pinus pinaster), called Pycnogenol, indicate that the herb may be useful in reducing symptoms and enhance lung function in those who have asthma. Another study found that when children who have asthma were given Pycnogenol in conjunction with conventional asthma medication, they had fewer symptoms and depended on less on quick-relief asthma medicines. Those with diabetes or on medication for high blood pressure should not use pycnogenol. Turmeric (Curcuma longa) is a member of the ginger family and has been used as a coloring agent, spice, and medicine for thousands of years. The active constituents are the diarylheptanoids, including curcumin, which is found in the vividly yellow rhizome. In an uncontrolled trial in India, 60% of asthma patients given 6-12 grams of turmeric powder that had been fried in ghee (clarified butter that originated in ancient India) showed relief in their symptoms. Curcumin is a powerful anti-inflammatory in both acute and chronic conditions, and it is believed to work in a variety of biological pathways to reduce inflammation. In some models studied, curcumin showed similar efficacy to cortisone and phenylbutazone. The root of Chinese skullcap (Scutellaria baicalensis) has been used in traditional Chinese medicine (TCM) for a variety of conditions including asthma. Chinese skullcap contains flavone derivatives including baicalin, wogonin, and baicalein which inhibit histamine release from mast cells in vitro. Baicalin showed antiasthmatic activity (antihistaminic and anticholinergic activity) in isolated tracheal muscle from asthmatic guinea pigs. Reducing hypersensitivity and inflammation in airways is vital to managing asthma. Grindelia (Grindelia spp.) is an expectorant herb with broncho-spasmolytic activity. It is traditionally recommended for the treatment of spasmodic respiratory conditions such as asthma and bronchitis. The British Herbal Pharmacopoeia 1983 lists the specific indication as bronchial asthma with tachycardia. Californian Native Americans used grindelia not only for skin infections but also for bronchial conditions where grindelia eventually gained the attention of the Catholic missionaries. The dried leaf and flowering tops of grindelia were official in the United States Pharmacopoeia 1882– 1926, and have been in the National Formulary, 1926–1960. Coleus forskohlii (Plectranthus barbatus) is an herb commonly used in Ayurvedic herbal medicine to treat asthma. Preliminary studies indicate that inhaled powder made from the herb might have a positive effect on symptoms associated with asthma. More research is needed to fully confirm the uses of coleus as an herbal asthma treatment. People suffering from diabetes or thyroid conditions should not take coleus forskolin. Licorice root (Glycyrrhiza glabra) has been used traditionally to restore breathing and calm the breathing passageways. Like all herbal medications, natural herbs for asthma treatment need to be focused on the individual, and any natural asthma treatment needs to address environmental and nutritional needs as well as reducing hypersensitivity of the airways. A proper herbal asthma remedy will help to reduce the incidence and severity of asthma and will form part of an overall treatment plan. Asthma should be taken seriously, and treatment must be taken under the supervision of a qualified healthcare practitioner. Always educate yourself about each herb before you start using it.